Visit the Donation Ledger Spreadsheet page for a fast run-down of all the donations made from this guide to those Battling Cancer. Yesterday, I wrote a notice that this month's ledger entry would be postponed for a day. It took longer than expected to get in touch with Dr. Ning Fang who is a Gold Nanoparticle Cancer Researcher at the Georgia State University, and the most recent recipient of the Angel of Healing Cancer Research Fund's Donation. Before I reached him, it had taken me nearly a month to contact him, I tried repeatedly through email, but never seemed to get through to him. Basically, I was fulfilling the definition of Insanity; I was doing the same thing over and over again, expecting a different result. So I tried calling Dr. Fang, and even though I didn't talk to him, the message I left got him to look for my emails, in his initial response he informed me that my emails were going to his spam folder. After he retrieved my emails, he asked me to further explain why I was trying to reach him. In a new email, I explained to him, who I was, what I do, and that I wanted to send him a donation to aid his research. I'd gratefully accept the donation to my group. I love the article on Naomi's research. She is a friend of mine. I can certainly do a similar "Q and A" with you. Please email me your questions. See the Q and A with Dr. Naomi Halas...here. I've since sent Dr. Fang a new email with my questions for the Q and A, and questions about where to send his donation, and now I'm just waiting on the answers to all my questions. 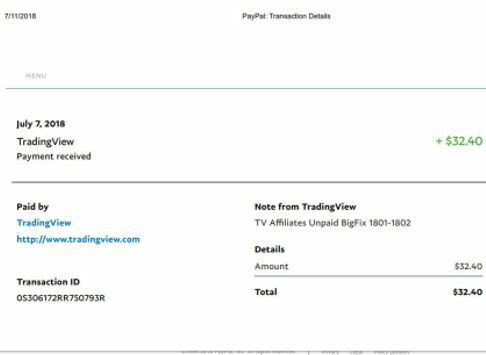 The donation for March will be made to Dr. Ning Fang, I've purchased the money order, seen below, I just need to know who receives the money for his group, and where to send the money order. Once I receive that information, I'll fill out the money order (above), and send it. I'll make a copy of the money order, and post it on the spreadsheet page, under the most recent entry, as I have with the last three donations. - You are incentivizing others to visit the Amazon Site via your Special Links by offering rebates, cashback, discounts, points, donations to charity, or other incentives, or by stating that customers can support you by shopping through your Special Links. I don't believe this clause was in the agreement when I signed with Amazon seven years ago, otherwise they would not have accepted me as an affiliate, but sometime between then and now they added it and on March 23rd, 2019, they decided to terminate our agreement. Now, I realize that Amazon also participate with Groupon and EBates, and it is a bit hypocritical for them to drop me and be affiliated with these other sites, but who am I to point out the obvious. Before they dropped my account, I checked on it a few days earlier and I think it said I had a commission of $2.36, I cannot remember the exact amount, because my account is closed, but I think I'm close. Below is the total earned for last month and the amount given. 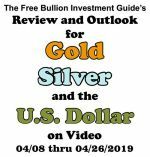 See the Ledger Spreadsheet for a list of every donation the Free Bullion Investment Guide has made and who received it. In just the last few weeks the Austrian and Israeli Bullion coins have had their mintages updated. As for my other work on the site, most of my work on the site has been mostly doing maintenance on pages as I remove Amazon.com ad codes. Also, recently the Perth Mint update their mintages so I'll be updating those numbers soon. 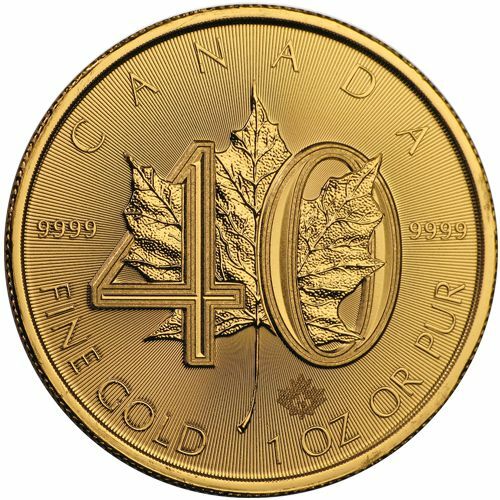 After I get done this maintenance work on the guide, I'm planning on adding another popular bullion coin series to the guide. So, Until Next time...Thank you for your time. 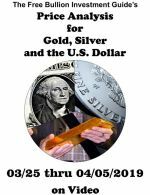 During the month of February, I thought this guide was going to earn enough money to send a donation to one of the Gold Nanoparticle Cancer Researchers that the Angel of Healing Cancer Research Fund supports. Unfortunately, we were unable to make enough to break the threshold for a donation, but about 3-weeks ago, I started to try to get in touch with Dr. Ning Fang who is the next recipient and an Associate Professor of the Chemistry Department at Georgia State University. 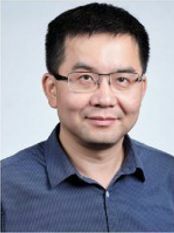 He helped to invent a new optical imaging tool that tracks and targets cancer cells using gold nanoparticles, the invention is called 'SPORT' which is short for 'Single Particle Orientation and Rotational Tracking. However, I have been having a hard time contacting him, but when I realized at the end of the month that we hadn't earned enough for a donation, I haven't been trying as hard as I initially was, but hopefully this month we'll make enough to cross the $100 threshold so I can send a donation to him. Furthermore, if for some unforeseen reason that I cannot contact Dr. Fang, I will be replacing him with Dr. Emily Day who is a Gold Nanoparticle Cancer Researcher at the University of Delaware. Whether I reach Dr. Fang or not, I will be adding Dr. Emily Day to the recipients of the Angel of Healing Cancer Research Fund, I will soon be adding a summary about her on the Funds page. Gene Therapy." you can also see her latest work involving fighting Breast Cancer with Gold Nanoparticles; here. I really hope we can send a donation next month, to one of the researchers above, I can tell you we are close to the $100 threshold, but I'd rather send a donation over $100, than one under. See the New Ledger Spreadsheet for a list of every donation the Free Bullion Investment Guide has made and who received it. In addition, over the last several weeks, the following pages have been updated. 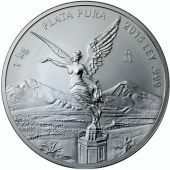 In regards to the Libertad Mintages the numbers on the coin pages are the Maximum amount of coins that will be produced for the year. All of these updates can also be found under 'Recent Guide Updates' found on the right side column of every page. As you may or may not know a YouTube Channel has been started for this guide, you can see it here. I posted the first video on January 14th, and over the last month the channel has added 24-subscribers. I wanted to thank all those who are subscribers, and just in case you didn't know, its free of course to be a subscriber. In addition, as far as seeing who has subscribed to the channel, I oddly find it to be kind of like Facebook, I don't see all my subscribers on YouTube or those who 'like or follow' the guide on Facebook. On Facebook, I screwed-up when I created the page, the guide's page is directly linked to my personal page, so because of my personal privacy settings, I can only see about half of those who have 'liked or followed' the page. Also, in relation to Facebook, I rarely do anything on Facebook because I found out after a while of posting articles on the page that what I posted wasn't reaching those who 'liked or followed' the page unless I paid for it to reach them. To me, that doesn't make a whole lot of sense, I understand paying to get new 'likes and follows,' but it makes no sense to pay to reach those who have already liked or followed your page. As far as seeing the subscribers on YouTube are concerned, I've been told its not my settings, but yours as to whether or not I can see the subscribers, but I respect your privacy just as much as I like mine, so I simply thank you for subscribing. I hope the channel brings new people to this website and I'm hopeful that it will bring more awareness to gold nanoparticle cancer research. Well, to be eligible for the YouTube Partner Program a channel needs to have 1000 subscribers and 4000 hours of watch time in a 12 month period. So, I've got some ground to cover, but through your help that will hopefully change. See the New Ledger Spreadsheet for a list of every donation made since the Free Bullion Investment Guide started to sponsor Foundations, Individuals who are Battling Cancer, and Gold Nanoparticle Cancer Researchers. Feel free to check them out, they are all great companies that offer good products and services. Until Next time...Thank you for your time. I hope you and your family had a safe, Merry Christmas & Happy New Year! I don't know if you saw George H.W. Bush's funeral, at the National Cathedral on December 5th, but in it, his pastor talked about a plaque that President Bush gave him that described how he tried to live every day and practice his faith. "Preach Christ At All Times, If Necessary Use Words." That hit home for me because that is how I try to live, however, I underlined 'try' because I rarely feel worthy. This ledger/journal post marks the one year anniversary for the beginning of the Angel of Healing Cancer Research Fund, the following is the story behind the naming of the fund. I had planned to call the fund, the 'Gold Nanoparticle Cancer Research Fund,' until I found out about the Archangel Raphael a.k.a. The Angel of Healing, and after I had some prayers were answered. Before the Fall of 2017, I'd never heard of the Archangel Raphael. 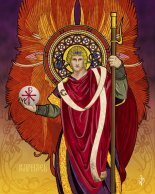 I found an image of him on Pinterest while doing an image search for a blog post, and when I found the image it said beneath it, "The Archangel Raphael." Like a lot of people, I'd heard about the archangels Gabriel and Michael, but I thought that was all of them. After I saw the image of the Archangel Raphael, I searched for him and found out that he was known as the Archangel of Healing. At this time there was a need for healing for my mother, in early November of 2017, she was scheduled to have much-needed knee surgery, and on top of that she has a heart problem, which added stress to the issue. So after learning of the Archangel, and being a Christian, I started to pray to my LORD and Saviour Jesus Christ, asking him to send the Archangel Raphael and his healing powers to help my mother have a successful surgery. Then a few days before my Mother's surgery, a spot that was found on my Fathers liver, during the summer, had grown and what the doctors said was nothing, was now a cancerous tumor. Furthermore, because of my mother's surgery was in a few days, my father agreed to wait until she was able to be with him to have his surgery to remove the tumor. All this time, I'm praying every day to Jesus to send the healing powers of the Archangel Raphael to my parents, and at this point, I've added that if my prayers are answered for my parents, I'll name this fund after him. My mother had a successful surgery, there were no problems with her heart during the surgery and replacing her knee went well. My father's surgery to remove the tumor from his liver was scheduled three weeks after my mother's surgery, however, even though he wanted her there, I had my doubts that she would be able to be there. Normal recuperation time for someone after knee surgery is 6-weeks. My mother was at my father's surgery, with a walker, but she hasn't used a walker since his surgery. The doctor told us after my father's surgery that the tumor had barely grown over the last three weeks, which was unusual, and that he felt very confident that it was completely removed from his liver. In addition, we didn't know if my father would need to stay overnight or not for the surgery, but by the afternoon they told him he could go home. That all happened in November and December of 2017, and as of 1/15/2019 my father is still, thankfully, cancer free. I can honestly say that I saw signs from the Archangel Raphael that told me he was near during this time. So, last January, I announced that I was starting a new cancer research fund, and that it was going to be called the Angel of Healing Cancer Research Fund which is my way of thanking Jesus Christ for answering my prayers. To date, the fund has given $243.25 to two different gold nanoparticle cancer researchers; Dr. Kattesh Katti at the University of Missouri, and Dr. Naomi Halas at Rice University in Houston, Texas. Of course, I wish it was more, but every penny counts, and I have no doubt that more will be given in the future. Lastly, before I move on, I wanted to let you know that I've started a YouTube Channel, and yesterday I posted my first video. The video is a review of my Q and A with Naomi J. Halas, it lasts for a little more than 9 minutes, and before you click on it, let me warn you that the video is far from perfect, you may hear a lot of 'ums' and I may mess up on a word or two, here an there. For instance, at the end of the video, I say that I'm going to post a new Gold Nanoparticle Cancer Research Report this weekend "In January of this Month" Then I mock myself by saying "It's one in the same." I guess its was just nerves, and it was after many takes, so I just left it on the video, I hope to get better as I do more videos. The only update to tell you that you can't find under the 'Recent Guide Updates' found on the right column of every page is the new YouTube Channel. You can find the Channel here. I meant to post this ledger/journal entry earlier today, but I've been battling a leak in my house. I know its origins, outside, but how it's getting in, I still have not found, yet. I live in Maryland, and I think 2018 has been the wettest year on record, or at least it feels like it. In this month's ledger/journal, I wanted to let you know the next Gold Nanoparticle Cancer Research Report will come out sometime in January. I will be making a change to its layout because I have gotten away from my original intent with writing them, I wanted to make them into simple summary reports that informed you about the latest news on the subject. Instead, in the last several reports, I've basically re-written each article or wrote an article on a published research study. So, I hope to make that change to the Gold Nanoparticle Cancer Research Reports and make them more into summaries about articles and or published studies on Gold Nanoparticle Cancer Research. 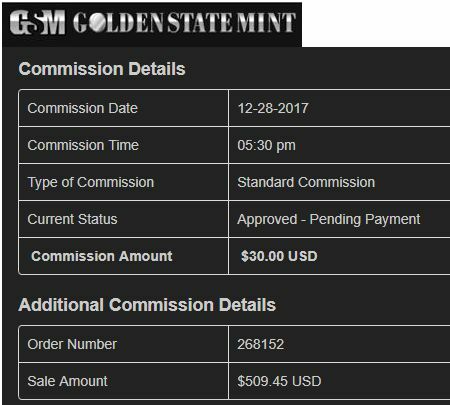 Sadly, this guide didn't have any affiliate commissions last month, but as I was checking my totals, I found an old commission from GoldenState Mint from October 19, 2017, that was still pending approval. So, I contacted them about the very old pending sale/commission and asked them if it went through, which it did, and I asked them if they'd still honor it, which they kindly did. In the last update section of this ledger, I told you that I was going to look into what it would take to make this guide Mobile compliant. I checked with my web host (SBI) and found out that one part of making the change would be really easy, by simply pushing a button I could make the site mobile compliant. However, my ancient site design wasn't set up to for mobile conversion and probably wasn't done until I pushed that simple button early last week. I know this because it caused some major issues, on my side (the editing side) of this guide, for my web host, but they fixed it. So now, when you bring the site up on a mobile phone, it shows you the center of the guide first, but if you keep scrolling beyond the bottom of the page, you'll see the left and right column squeezed together under it. So, this guide is now mobile compliant, it could be better, but I'm broke and when you're broke you make do with what you got. Plus, even though I don't own a Mobile phone, when I saw how it looked on a Mobile screen, I was mostly happy with how it looks. I hope to make it better in the future. Otherwise, I've made a ton of updates on this guide and you can see what those updates are under the 'Recent Guide Updates' on the right side column (desktop), which on a mobile phone can be found by scrolling under this page (or any page of this guide). Thank you for your time and until next time, I hope you and your family have a Merry Christmas & Happy New Year! At the end of last month, I found out the Angel of Healing Cancer Research Fund's total climbed over $100.00, which indicated that I needed to contact Dr. Naomi J. Halas. She is one of the recipients of the Angel of Healing Cancer Research Fund which donates its money to those who do Gold Nanoparticle Cancer Research. Dr. Halas invented gold-nanoshells in the 1990's, she is also the Director at the Smalley-Curl Institute, a Stanley C. Moore Professor of Electrical and Computer Engineering, and she is a Professor of Physics and Astronomy, Chemistry and Bioengineering at Rice University in Houston, Texas. In addition, Naomi is the co-founder of Nanospectra Biosciences a privately-held medical device company, pioneering the patient-centric use of nano-medicine for selective thermal ablation. So, I contacted Dr. Naomi Halas and asked her if she would answer a few questions that I thought you (the reader) would like to hear, and she graciously accepted, below are my questions (with some editing) and her answers (in blue). 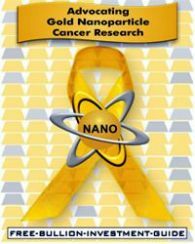 Q: In your perspective, how much of the medical/oncology community recognized Gold Nanoparticle Cancer Research as a viable alternative to chemotherapy? or As a better way to administer chemotherapy? Q: The Market - I know of only one Gold Nanoparticle Cancer Research Study, in the United States, that currently is using Humans in its Trials, (link: https://bit.ly/2QFu8Qg), and one in India (link:https://bit.ly/2FkDRdO). What is your perspective on how close or far away Gold NanoParticle Cancer Therapy is from coming into the market? Over the coming weekend, I'll we be working on a blog post about Dr. Naomi Halas's work, and the answers to the questions above. See the Bottom of the Ledger Spreadsheet page: here, to better understand the donation amount for this month. In the last two updates for the guide, I've told you that I was going to change the URL from HTTP to HTTPS, its done, and it didn't cause any of the interruptions that I had thought it might. The next hurdle that I need to tackle is making the guide Mobile compliant, which I will be finding out what is needed for that to happen sometime soon. One quick note about the HTTPS before the URL, some pages of the guide will show a locked sign before the URL on your web browser, while others will show an unlocked sign. I'm working on making all the pages locked (encrypted), which are just some small HTML code issues, I've corrected about 100 pages, I got another hundred to go. Thank you for your time and until next time. Thank you for visiting this ledger/journal page. 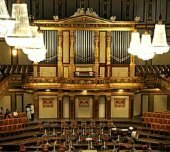 In the case that you're new to this site; on this page, every month, I try to bring you up-to-date, on what I've been doing. There are three sections to every ledger/journal entry, the first is the intro, where I let you know about the biggest things that are on my mind. Sometimes, I have very little to say, other times not. The second part of this entry is the ledger, and it shows the donation amount that is to be given to Gold Nanoparticle Cancer Research, and how the money was earned. 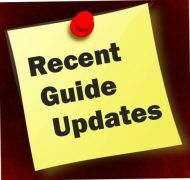 The third section of the entry consists of updates to the bullion guide that aren't posted under the 'Recent Guide Updates' which is found on the right column of every page. Currently, I'm working on posting a new Gold Nanoparticle Cancer Research Report, the first draft is done, so I will hopefully have it posted by tomorrow afternoon or evening. As mentioned in the last updates section, I plan to change the 'http' prefix of this guide's url to 'https' in the next few weeks. 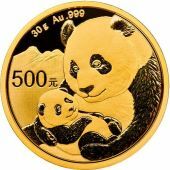 Other than that, I've been updating and adding pages to the bullion guide, they are posted under the 'Recent Guide Updates' on the right side of every page. Lastly, I thought I would leave up what I wrote in this section last month about a new web-browser that I like and I thought you may like it too. The web-browser is called Brave, below is what I wrote last month. Lastly, I just wanted to give you another heads up on something, but this doesn't have anything to do with this guide. I just thought I would inform you about a new web browser I recently found that automatically blocks Google's annoying ads. Its called 'Brave,' they only have a little over 10-million subscribers, but the browser is faster than chrome & firefox, and it keeps out a lot of the tracking software that is found on a lot of sites. Just so you know, 'Brave' is not an affiliate of mine, I'm not making a dime if you click the link (below), or by giving you any of this information, there's nothing to pay for, if you want it, download it, that's it. I've been using the 'Brave' web-browser for about a month and I like it, so I thought I'd pass it on to you because I think you like your privacy as much as I do. I hope your summer was a good one, I don't have much to say in this month's journal section of the ledger except to tell you that a few days ago I finished and published the latest issue of the Gold Nanoparticle Cancer Research Report, you can see it here. I have a little more to say in the Updates section, below the donation section of this ledger. In this section, I first wanted to send my condolences to the family Don Bailey, who passed away last month. Don ran 'Lois & Don Bailey & Son Numismatic Services', which specialized in Mexican Numismatic and Bullion coins, you can see an article that CoinWeek wrote about his death here. I have just a few updates to tell you at this point, I'm currently working on getting all the mintage numbers up-to-date for all the bullion coins. As I get them done, I will post them under the 'Recent Guide Updates' heading on the right column. In addition, perhaps before the next ledger entry (10/15), I will change the 'http' part of the URL to 'https' - it shouldn't create too much of an issue for anyone, at most you may need to update your bookmark for the site. I wrote 'perhaps' only because I'm not sure yet if I'm going to do it this month or next, but I've said here before that I would tell you when I was going to do it, so in the next 60 days, it will happen. In this ledger entry, I wanted to inform you as to why there won't be a Gold Nanoparticle Cancer Research Report this month. I started to write a post for the tenth addition to the report, but each of the research papers that I was going to report on, had misleading variables in them, about the research. The study is about how researchers from the State University of Moscow, in Russia, combined Magnetite, a naturally occurring magnetic rock, and gold to create eight-sided, multi-purpose nanoparticles. They created them for targeting, imaging, and ultimately killing cancer cells with the help of an attached chemotherapy drug called Doxorubicin (DOX). They completed, very well, the experiments that targeted and took florescent images of the cancer cells with the magnetite-gold nanoparticles. However, when it came to killing cancer cells, they failed to use an external catalyst (laser, infrared light or ultrasound waves)to get the nanoparticles to release the drug once it found their target cells. Instead the researchers, in this study, tried to use the high acidic 'ph-levels' found in a cancer cell to degrade the antibodies that were holding the drug onto the nanoparticles. Ultimately, this method didn't work that well, it took a very long time for the antibodies to degrade and release the drugs into the cancer cells. In addition, they found out that drug by-itself killed more cells than the than the magnetite-gold nanoparticles because their method was too slow in releasing the drug. Consistent with this data, DOX-NP-Cy5 (DOX - Doxorubicin ), (NP - nanoparticles) , (Cy5 - florencent dye) are able to kill 4T1 cells after 48 h co-cultivation, although not as effective as the free drug. So, because of the fact that the nanoparticles weren't able to kill cancer better than the drug by itself, I thought that the title of this research paper was misleading and decided to scrap it from the report. I also wanted to share with you another research paper where I found some other disingenuous information. Furthermore, these experiments tested the gold nanoparticles and the TS265 compound to see how efficient they were at killing cancer. The cancer cells that were used were Doxorubicin (DOX) resistant cancer cells (HCT116-DOXR) and cancer cells that weren't resistant to Doxorubicin (HCT116). In the first experiment, they tested the gold nanoparticles that had TS265 compound attached to them to kill cancer cells. In their results, they saw some cell death among both types of cancer cells. In their last two experiments, the researchers used a green visible laser (photothermia) to act as a catalyst to heat up the gold nanoparticles to cause the cancer cells to die and it helped in releasing the drugs from the nanoparticles. In the second experiment, they used gold nanoparticles along with the green visible laser to heat and kill the cancer cells. These gold nanoparticles had none of the Cobalt chemotherapeutic compound attached to them. In the second experiment, they found that when the green visible laser was shown onto the gold nanoparticles that had no drugs attached to them that they killed 91% of the HCT116-DOX-Resistant cancer cells and 66% of the HCT116 cancer cells. Whereas, in the third experiment, when the researchers attached the Cobalt chemotherapeutic compound to the gold nanoparticles and directed the green visible laser onto them, inside the cancer cell, they killed 65% of the HCT116-DOX-Resistant cancer cells and 61% of the HCT116 cancer cells. Like the other study, the title of this one doesn't reflect the outcome of their experiments. The nanoparticles that they created do kill cancer, but they were not as effective as gold nanoparticles by-themselves. I posted these two examples to give you a glimpse of what I found in the gold nanoparticle research reports that were released in July. I cannot knowingly report on information where I find inconsistencies. As for releasing the tenth issue of the GNPCRR in September, I can tell you that I haven't seen any research reports yet, but perhaps I've either over-looked something or perhaps more will be coming in the second half of August. As for the last nine Gold Nanoparticle Cancer Research Reports, you can find them here. 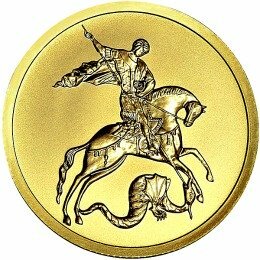 The one update that wasn't posted under the 'Recent Guide Updates" on the right side of every page, is that the Mintage figures for the Mexican Gold Libertads have been updated for 2018. In this ledger entry, I want to address some affiliate sales/commissions that weren't previously recorded. Over the last 3-weeks, I have had two separate affiliates inform me of two affiliate sales that were not reported to me until now. The affiliates are GoldenState Mint and TradingView.com, and I want to give you the full honest rundown of how they were missed and how they have been recorded. So first, here's a copy of an email I received from Goldenstate Mint on the 27th of June. 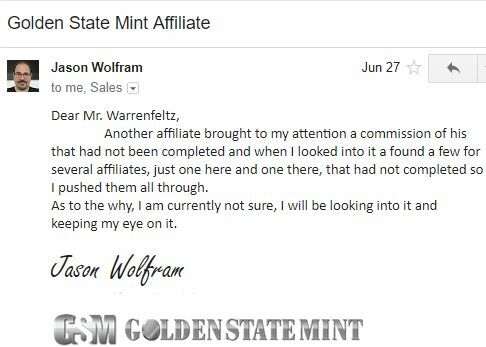 I thought it was a little strange when I received their email because I removed GoldenState Mint as an affiliate due to inactivity at the beginning of the year. However, even though I had removed them, my affiliate account with them was still open, and that is why they were able to contact me about this sale & commission. 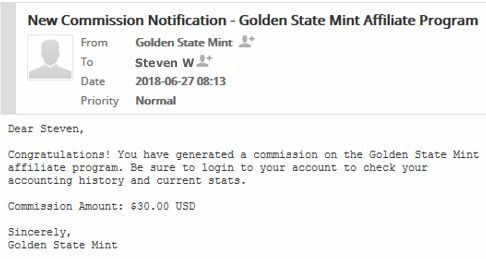 So I opened my GoldenState Mint affiliate account and this is what I saw. I do not have a copy of that email, but here is their response. 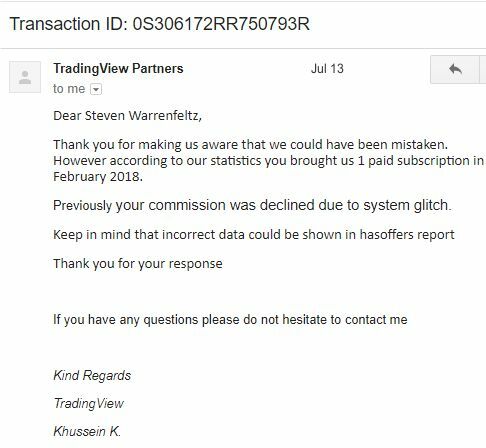 To my surprise, they responded within a few minutes of my email and as you can see in the email response, I didn't get any excuses, Mr. Jason Wolfram gave me an honest response. 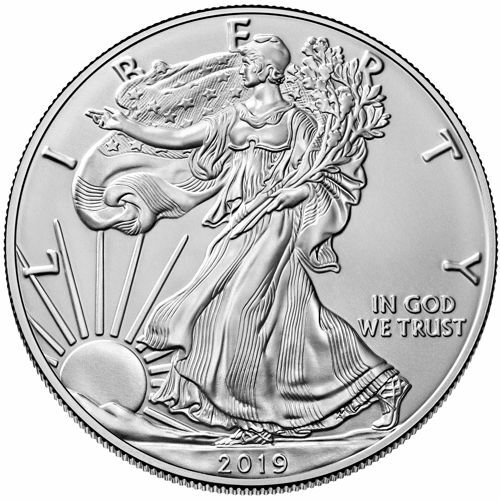 As to the commission, there is a stipulation with GoldenState Mint commissions that you may not know about and that is that for an affiliate to receive a commission from them, a customer has to order more than $500.00 of merchandise. Furthermore, if you look at the sale amount, above, it just cleared the $500.00 mark. So I think that whoever it was that made this purchase, did so, so that this guide would receive the commission, but moreover, so we would also donate half of the commission to cancer research. However, all the commissions we received, before the end of the year, went to St. Jude Children's Hospital. So today, I donated $15.00, which is half of the $30.00 commission to St. Jude Children's Hospital. On the Ledger Spreadsheet, this amount has been added to the LXX payment, which was the last payment made to St. Jude Children's Hospital, on 1/11/2018. In addition, I'm going to add the other half to this month's donation to the Angel of Healing Cancer Research Fund. I also put GoldenState Mint back onto our Affiliate List. Lastly, to the person who made the purchase on 12/28/2017, Thank you, and I'm sorry your contribution was recorded earlier. Now, let's get to the other affiliate commission that didn't come to my attention until recently. 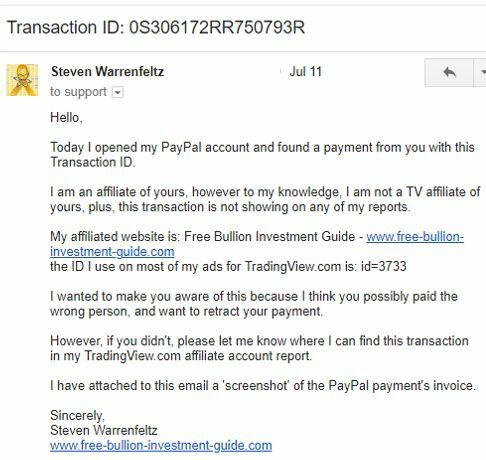 The affiliate is TradingView.com, and I found out about this commission because a few days ago I opened my PayPal account and found money in it that I did not think belonged to me, so I sent TradingView.com the following email. This was the first I knew of an affiliate sale from Tradingview.com in February 2018. However, as you will see in the donations section below, half of the PayPal invoice, above, is added to the Angel of Healing Cancer Research Fund for this month. I would also like to Thank the individual who made the purchase with Tradingview.com, your support is very appreciated. Just as a reminder, the latest Gold Nanoparticle Cancer Research Report was released last week; see it here. This ledger entry is going to be very short for one reason, I've got a bad headache and I'm not feeling good. Before I move on, I just wanted to let you know that this month's total earnings for the guide were below $10.00, so instead of making a donation of half the amount to the Angel of Healing Cancer Research Fund, I'm putting the full amount into it. There are no updates at this time, thank you for visiting the Free Bullion Investment Guide. Hello, Thank you for visiting, and I hope that you and your family are doing well. In this ledger entry, I wanted to let you know that last week I posted - Gold Nanoparticle Cancer Research News - #7. Most of the articles I review and summarize for the Gold Nanoparticle News Reports are written for medical professionals, and not for the everyday person. But, in my view they should be, if the everyday person wanted to know what is happening with this research they shouldn't need a medical dictionary to understand the words written in these articles. That's where I come in, I do the searching in medical dictionaries for a lot of the text in these articles, then I summarize the articles to make them more understandable in my blog posts. I hope you visit the post above to read the latest post. First, I wanted to let you know is that I've started to post excerpts of my blogs on 'Steemit.' Steemit is a cryptocurrency geared toward bloggers, you get paid by the number of votes and visits you receive. I've only been on there for a little over a month and haven't made much money, but, starting this month, what I make in votes and rewards, will be posted with the other donation totals. And the second thing that I wanted to tell you about is that starting next month, I'm changing the ledger report date from the 11th to the 15th of every month. 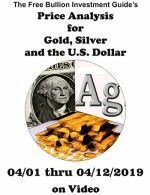 For this ledger entry, I'm happy to let you know I've sent a donation to Dr. Kattesh Katti of the University of Missouri for his work with Gold Nanoparticles. Dr. Katti's cancer research revolves around Ayurvedic medicine and Gold Nanoparticles. Ayurvedic medicine originated in India more than 3,000 years ago and it uses herbal compounds to treat patients. Last week, I spoke to Dr. Katti on the phone for about 10-minutes and learned some very interesting information about his work. He informed me that his research is currently being conducted at the University of Missouri and in a separate research facility in India. His research currently involves treating prostate and breast cancer with his 'Nano-Ayurvedic Medicine' and he told me that he is conducting Human trials in India and he said he's been seeing "very positive results." We spoke about other issues concerning our current forms of treating cancer and we both agreed that a better way needs to be used. For anyone who'd like to help Dr. Katti's cancer research, I would encourage you to visit this page and either email him or contact his administrative rep: Kristina Conrad, who I have found to be very helpful. Before I move on to this months donation I wanted to quickly update you on a subject I wrote about in the 71st ledger entry, two months ago. It involves my father, who was originally mentioned on the the Angel of Healing Cancer Research Fund page as to why I gave it that name, however,he asked me to remove his name and information on the internet, so I did. I'm not going into detail any more than what I wrote about two months ago except to tell that his liver is now Cancer Free. I have only two explanations for his cancer reversal, a good doctor and answered prayers. I prayed daily asking Jesus to send the Archangel Raphael (the Angel of Healing) to remove the cancer from my father's liver. Who am I to get my prayer answered? A: no one - just a normal guy, that's how praying to Jesus Christ works, all you have to do is have faith. Here is a PhotoCopy of the Money Order that was sent to Dr. Katti, all payments sent through the Angel of Healing Cancer Research Fund will be photocopied for your review.